Work is continuing apace on Álvaro Siza's first U.S. project at West 56th Street and 11th Avenue, on the westernmost edge of Hell’s Kitchen, Manhattan. The 35-story luxury tower is slated to rise 400 feet, and it almost goes without saying that the 80 residences within are for the ultra-wealthy. 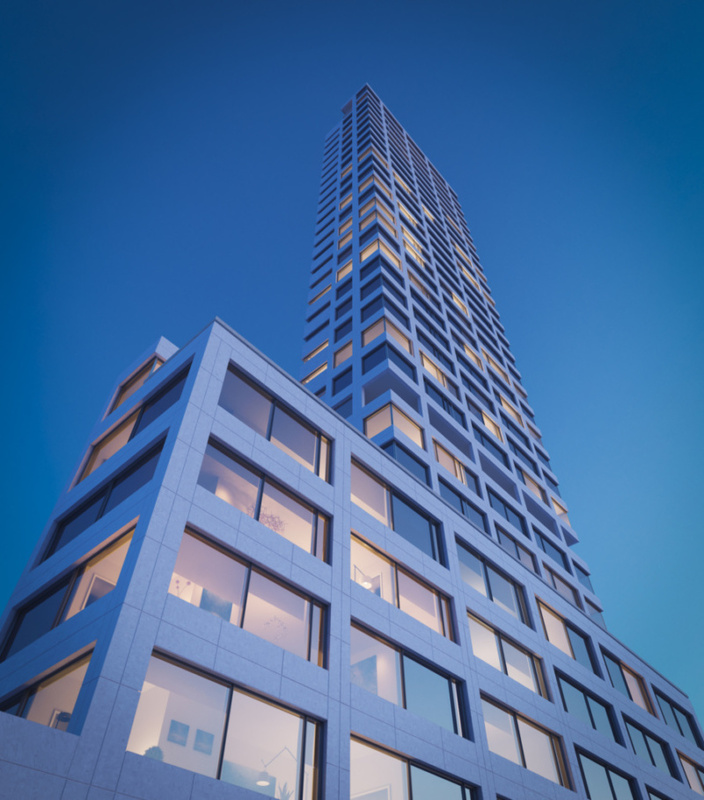 Occupants will be able to take in Hudson River views from a landscaped roof garden and a sun deck, as well as from private terraces attached to select apartments. Inside, there will be a fitness center, as well as an entertainment space, and a children’s play area. Back in January 2016, The Architect’s Newspaper (AN) got an exclusive first look at the project, only the second tower by the Pritzker Prize–winning Portuguese architect and his first building in the U.S.. Comparing this building to Siza’s 500-foot-plus apartment building in Rotterdam, the Netherlands, which features a deco-like wedding cake top, AN Senior Editor Matt Shaw called 611 West 56th Street “more subtle and refined, akin to Siza’s early structures like the Boa Nova Tea House and Piscinas de Marés in Portugal,” with a “subdued” crown that tops a proportional gridded base. Plans for the project were filed in April of last year. Interior designers Michael Gabellini and Kimberly Sheppard (founding principals of Gabellini Sheppard) are working with Siza on the building’s interior spaces, which total more than 173,000 square feet. New York’s SLCE Architects is the architect-of-record for the project. 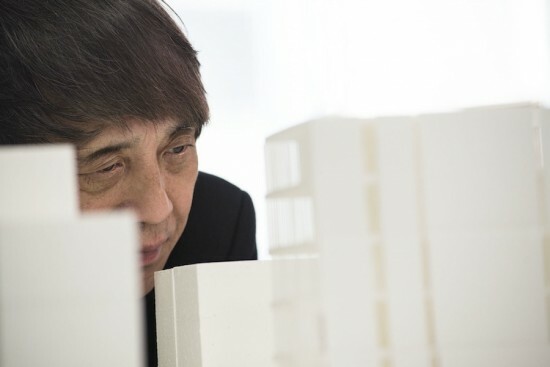 Since news about a Tadao Ando–designed residential building in Manhattan's Nolita neighborhood broke in March, anticipation has been building about what the Pritzker Prize–winning starchitect had planned for his first large-scale project in New York City. Now, renderings of the seven-story project have been published by Dezeen, but they offer a frustratingly vague sense of what's in store for Elizabeth Street. 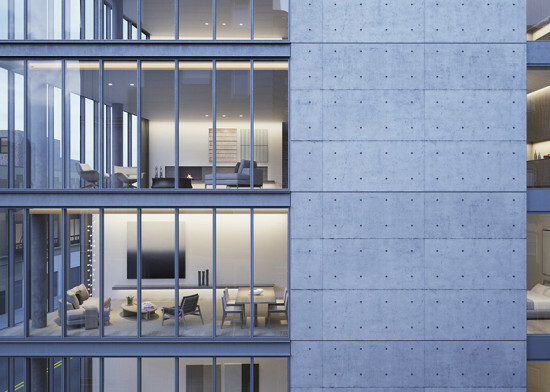 Here's what we do know: the building has floor-to-ceiling windows, a significant concrete wall on at least of its sides, and a rooftop terrace with a reflecting pool. Dezeen reported, “It will be constructed using in-situ concrete, galvanised steel and large expanses of glazing"—materials that Ando has used for many projects, from his 1989 Church of the Light in Osaka to the recently completed art and design school at the University of Monterrey. The building only houses eight units, each of which has interiors designed by Gabellini Sheppard Associates. All to say, these apartments won’t run cheap so Ando fans better start saving their cash now—the building opens in 2016. While Ando has received multiple awards and international acclaim, this is his first major entry into the New York market. But it is not his first: Ando designed the lobby and penthouse at 43 Crosby Street and the interior of the Morimoto restaurant. As his first ground-up project gets underway in New York, he is also expected to break ground on an expansion of his Pulitzer Arts Foundation in St. Louis. 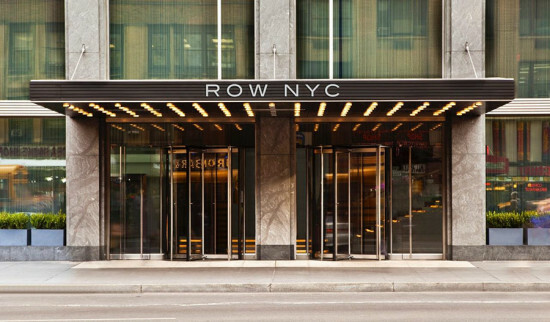 New York's newest boutique hotel, Row NYC, opened its doors at the end of March in Times Square. This launch comes after two years and $140 million were spent on developing the 1,331-room property at 800 8th Avenue, a collaboration between Highgate Hotels and Rockpoint Group. This hotel strives to bring the pulse of the city into the experience of its visitors and redefine the Midtown Manhattan hotel experience. Row asked New York–based architecture and design firm Gabellini Sheppard Associates to integrate elements of the city's redesigned grittiness into their hotel. Upon entering the space, visitors are immediately confronted by a twenty-four-foot-high entry space that draws off of the electricity of the surrounding area. The double-height lobby is accessible through a grand, illuminated staircase meant to lend a theatrical sensibility to the entry sequence. The entryway combines industrial and organic elements to create a space that feels both intimate and limitless. The reception area is flanked by two light sculptures by New York artist Yorgo Alexopoulos. Row's restaurant, District M, features items from New York's most famous bakeries and bistros including Payard, Murray's Cheese Shop, and Balthazar. A full market is expected to open later this year called City Kitchen that will offer additional cuisine from around the city. According to a statement from Row, "it will be a respite for foodies who work in the area and allow guests to get a taste of New York's finest without ever having to leave the property." The hotel will have a digital art gallery that features work by Ron Gabella, the so-called "godfather of U.S. paparazzi culture." The collection will feature images of Manhattan during the late seventies and early eighties. Never before seen images by Gabella will be featured in guest rooms. 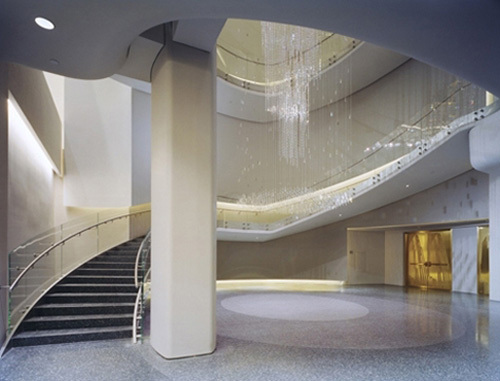 It’s hard to imagine that the cool and suave young architect who launched Minimalism on Park Avenue with the Jil Sander Store in 1983 is the same man who brought us the modern apotheosis of Art Deco at Top of the Rock. Is it a space? Is it a ride? It certainly has a chandelier! Michael Gabellini, FAIA, a principal of Gabellini Sheppard Associates, a RISD grad, and a Kohn Pedersen Fox alum, waxed poetic at the Archtober preview: "Top of the Rock epitomizes Archtober’s mission of raising awareness of architecture and design. By restoring public access, the project celebrates and embraces the ongoing life and vitality of Rockefeller Center." As I’ve been saying for months, almost 50 million people don’t come to New York every year to enjoy purple mountains' majesty. They come for a different view…and from the Top of the Rock, 70 stories above Rockefeller Plaza, they get it. Jaded New Yorkers may stay away from this tourist destination, but they shouldn’t. Gabellini has created an extravaganza of sparkle that will cheer one and all on even the gloomiest day. Each “Building of the Day” has received a Design Award from the AIA New York Chapter. For the rest of the month—Archtober—we will write here a personal account about the architectural ideas, the urban contexts, programs, clients, technical innovations, and architects that make these buildings noteworthy. Daily posts will track highlights of New York’s new architecture. Read more at www.archtober.org/blog.